In my mind, there's no cozier month than October. Dark greens, navy blues, and bronzes all come out of the closet to mingle with falling leaves and cooler days. Even in sunny L.A., this is the month when summer finally ends and we start building fires on chilly nights. Here are our Autumn picks from The Reed for October. And, hey—15% off for blog readers through the weekend (ends 10/4) with the code RABBITRABBIT. Starting at the top left corner: Brookes Boswell Bronze Wool Boro Hat ($170); Vintage Fairbault Tailgating Blanket ($69); Grundéns Swedish Brigg Rain Coat ($349); Brass Sporting Dog Figure ($49); Vintage 1981 Jeep Grand Wagoneer Toy ($29); GREI. Indigo Selvedge Scarf ($95); Armour Lux Slippers ($85); Joshu+Vela Olive Wax Utility Tote ($180); Woolpower Zip-Neck Base Layer ($125); Buck Products Mini Marsupial Backpack in Coyote ($120). Keep up with new product releases and fun times on Instagram: @lgmetter & @the_reed_shop. Oh I love fall! 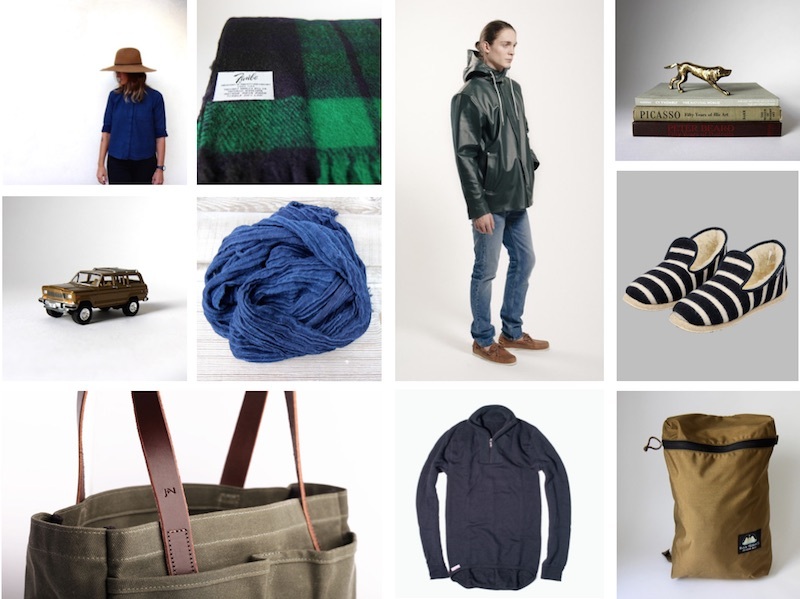 Fun selection, I'm drawn to the Wool Powered–clothing looks so cozy!